Home » Skin Care » Why Do I Have a Lump behind My Ear? It can be alarming to find something on your body, such as a lump, that isn’t supposed to be there. However, it may surprise you to learn that lump behind ear is actually quite common. You may have had a pea-sized lump behind your ear many times in the past, but never noticed because you can’t see that area very often. Lumps behind the ear have a number of different causes and can come in a variety of different types. Lump behind ear is formed as a result of the swelling of glands called auricular lymph nodes. The swelling can be caused due to a skin or ear infection or can be because of a cold or a sore throat. Usually, these bumps behind the ear are not serious and should go down on its own. But if the swelling lasts for more than 2 weeks, it could be a result of a more serious infection and should be checked by a doctor. Pimples in the ear can develop wherever a hair follicle or pore becomes clogged. The skin behind your ears is no exception. While pimples are less likely to develop there due to the area’s relative isolation, it can happen. This is a fancy way of saying a swollen lymph node. They are ovular, vaguely kidney-shaped organs that are distributed throughout the body. Lymph nodes also produce lymph fluid in response to infection. There is a lymph node in the neck that can sometimes appear as a bump behind the ear if it begins to swell. In and of itself, a swollen lymph node is not a cause for concern. It happens as part of the body’s response to many different conditions and can sometimes persist for a while, even after the infection itself clears up. Any infection that causes swelling of the throat can cause a bump to appear behind the ears. Mononucleosis, for instance, commonly occurs with throat swelling and the above-mentioned lymphadenopathy. Obviously, the severity of your infection will affect how much of a concern the ear lump is. A lipoma is a fatty lump that forms between the layers of your skin. These can appear anywhere on the body and are almost always harmless. Depending on their size and the layers they form between, a lipoma is not always noticeable. This generally clears up on its own. The main form of cyst that can appear behind the ear is an epidermoid cyst. Your skin (epidermis) is topped by a thin layer of cells that your body regularly sheds. Sometimes these cells move deeper into the skin and begin replicating when they are supposed to fall off (i.e. due to a damaged follicle or oil gland). These cells form the walls of the cyst and begin secreting keratin. Epidermoid cysts are sometimes called sebaceous cysts, although this term is misleading. A true sebaceous cyst originates from oil-producing sebaceous glands and is filled with sebum, not keratin. 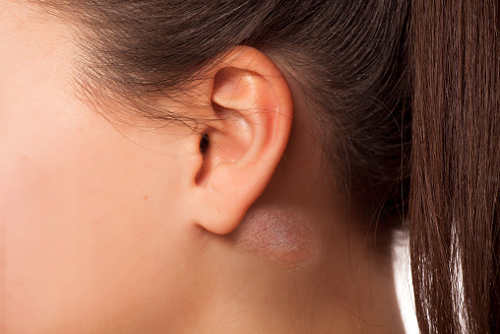 Having said that, true sebaceous cysts—while rare—can also form behind or on the ear. Abscesses and cysts are similar in the sense that they are enclosed “capsules” filled with fluid. The main difference is that an abscess is filled with pus. An abscess can develop around foreign bodies, infections, or form out of existing cysts. The mastoid bone runs directly behind the ear. Ear infections can sometimes spread to the mastoid bone and result in swelling or lumps behind the ear. A growth from the tissue of the salivary gland, mastoid bone, or skin behind your ear could be a tumor. These result when cells multiply uncontrollably instead of self-destructing at the end of their life cycle. While only a malignant tumor is cancer, a benign one can still be problematic. Depending on its size and placement, a benign tumor could affect the hearing quality or cause dizziness. Your hand is the main tool for detecting lumps behind your ear. Touch the lump. Lipoma is typically painless and acne or cysts are tenderer. Furthermore, acne, cysts, and abscesses tend to consist of localized bumps while something like lymphadenopathy or an infection would feel more like generalized swelling. Cysts and acne are often more irritating than painful, while abscesses are likely to be inflamed and will feel warm and painful to the touch. For acne specifically, pimples tend to form a “head” that can sometimes be felt. Getting a good look in the mirror can be tricky for a lump behind the ear, but it is possible. If it looks like a small fleshy lump, it is probably a lipoma. If the area looks localized and inflamed, it is likely acne, a cyst, or an abscess. Check to see if there is any fluid leaking from the mass. The keratin from an epidermoid cyst is thick, yellow, and foul smelling, while a sebaceous cyst gives off oil and pus from an abscess is green or white in color. Many of the causes of lumps behind the ear create other symptoms as well. A painless lump with no other symptoms probably means lipoma, while swelling accompanied by fever or a sore throat is more indicative of an infection. Pay attention to the signs your body is giving you and definitely talk to your doctor if they persist or get worse. The cause of the lump is an underlying ear infection. Create a strained mixture of olive oil and garlic oil and place one to two drops into the infected ear. The swollen node is in your neck. Gargling turmeric or salt water can help alleviate the symptoms. Do not “pop” a cyst or abscess. Instead, a warm compress can help drain the fluid and offer some relief from any discomfort or pain. A cyst can sometimes be treated using tea tree oil as well. Soak a cotton swab in tea tree oil and hold it to the cyst for about five minutes, then wash with an oil-free soap. This will help dry up the fluid inside the cyst and help relieve any swelling. Home remedies are best used for only short periods. If your symptoms persist, especially without any relief, the matter is best brought to a doctor’s attention. Any accompanying symptoms do not seem to be lessening over time or are getting worse. “Epidermoid Cysts (sebaceous Cysts),” Mayo Clinic web site; http://www.mayoclinic.org/diseases-conditions/sebaceous-cysts/basics/causes/con-20031599, last accessed August 6, 2015.